This pizza is bursting with flavor! 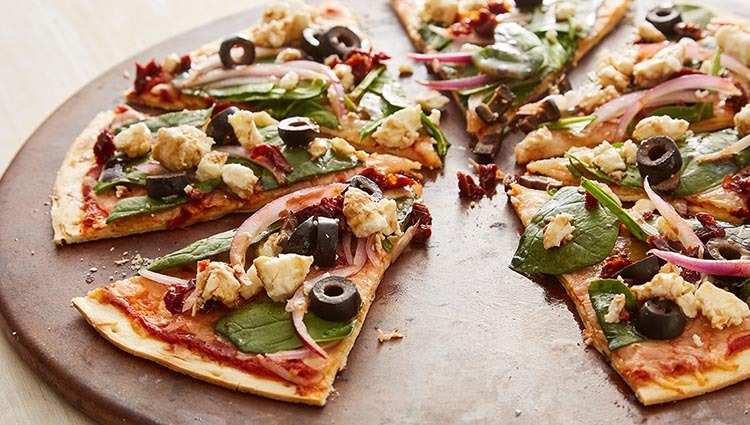 Topping with Odyssey Tomato Basil Feta makes this pizza a delicious crowd-pleaser. Place the pizza crust on a pizza pan or stone. Spread the sauce on the pizza crust. Sprinkle the provolone and mozzarella on the sauce. Bake for 7-9 minutes in a 375° pre-heated oven or until the crust is lightly browned. Remove from the oven. Arrange spinach leaves over the top of the pizza. Arrange the red onions over the spinach; sprinkle the Odyssey feta cheese, black olives and sundried tomatoes over the top. Lightly drizzle the balsamic vinegar, if desired. Tip: put the assembled pizza back in the oven to warm the remaining ingredients.